We’re excited to announce that our new and improved app for iPhone and iPad is now available in the App Store. The app has been completely reimagined to make it even easier to respond to your customers, schedule messages, and monitor performance – no matter where you are. In addition to a complete redesign, the app includes more than 200 enhancements, as well as some fun hidden features. Here are a few of them. 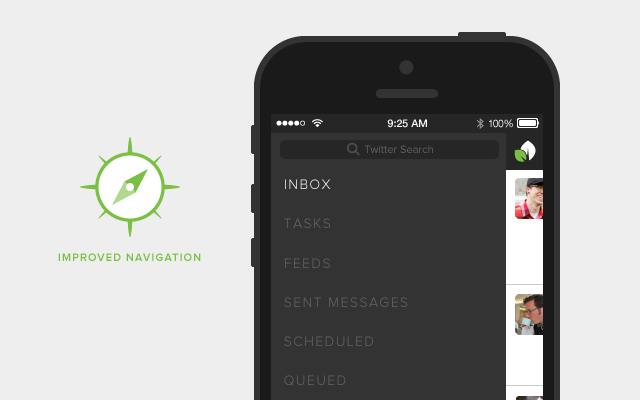 We’ve completely updated the app’s main navigation. Tap on the leaf to slide open the menu to jump to another section and access the Groups selector. Within each section, tap the configure bar at the bottom to select different profiles, messages types, feeds, and more. From the top bar, swipe to switch between sections. 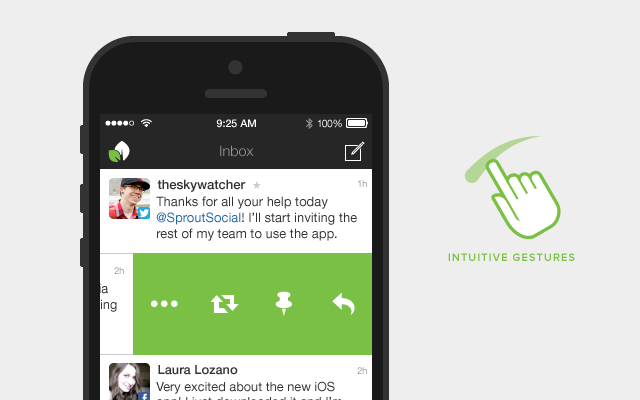 From any message, swipe to reply, task, archive and more. From Feeds, swipe to retweet or compose a new message from an article in your RSS feed. Swiping works across the app, so try it out in every section. 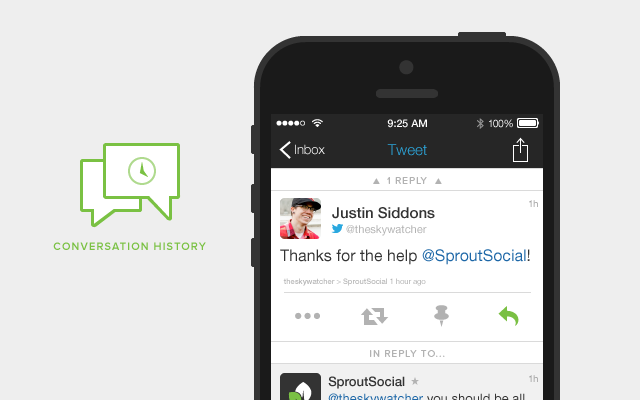 Because context is critical when engaging with your customers, we’ve made it seamless to see your conversation history in the new app. Just tap on any message to see all of the messages in that particular conversation. Want to know how many people are retweeting, replying to, or liking your posts? 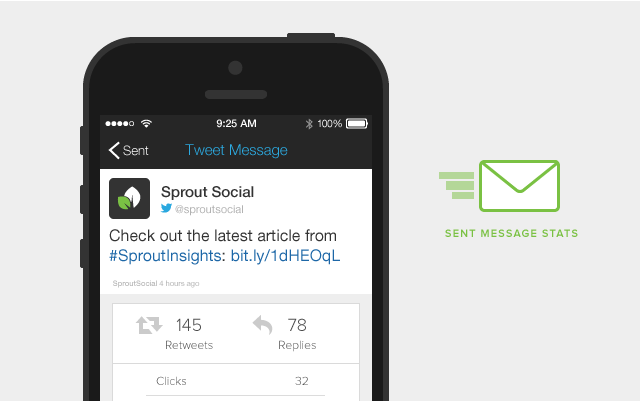 Swipe over to Sent Messages and click on any message to see sent message stats. Images from your Twitter and RSS feeds are displayed inline, so you can check out the photos posted by the people and publications you follow before retweeting or sharing. 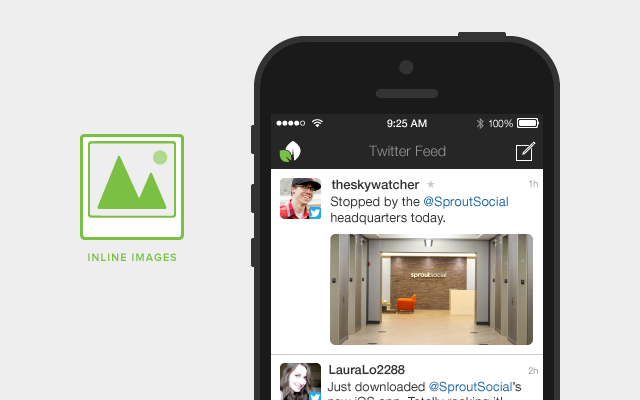 Managing social media on the go can be tough – download Sprout’s new app for iPhone and iPad today to publish content and engage with your audience no matter where you are.